I have over 10 years experience as an IT Consultant. I’ve work closely with clients and analyzed their IT requirements and needs, planed projects and exceeded clients expectations. I’ve worked on several Unix infrastructures and internal application systems including web-servers (Apache, Nginx), TCP/IP networking, architecture and core technologies (DNS, SFTP, SSH, etc) I can also provide following web solutions. Web Development: - CMS, E-Commerce, CSS3, HTML5, Responsive Design. Web Solutions: - Website Design, Website Maintenance, PHP, WordPress, joomla, MySQL and Linux servers. You'll find me to be dependable, on time, hardworking, and accurate in our maintenance and high quality standards and data confidentiality for all my clients and provide them cost effective and qualitative solutions. I am looking forward to working with you to build a long term relationship and support for your great business! Please do contact me in case you need more details. 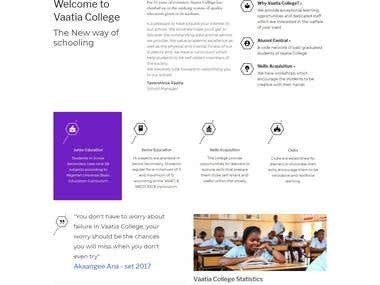 I provided technical support to the staff of Vaatia College, perform trouble-shooting functions and resolved a lot of the IT issues I found in the college. I also design and install a student management software for the college, step a reliable internet infrastructure and oversee the efficient running of these installations till date.